and how can you avoid them? With the forthcoming extension to the SM&CR regime, it is wise for Senior Managers to understand the extent of their personal and corporate risk. Now the FCA have been at pains to emphasise that this regime is about cultural accountability rather than penalties, however that doesn’t mean that the extent of the FCA’s power should be underestimated. As the Chairman of a top 20 insurer put it to us last week: “You could say that the FCA have more power than the Police!”. What penalties have been applied by the SMCR so far? 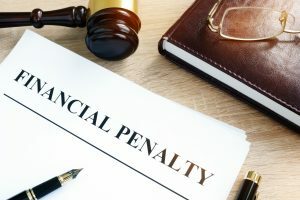 At the time of writing the penalties attached to the regime have been mainly financial rather than custodial with 4 fines having been imposed against individuals in 2018 totalling £785,000 (see the FCA’s website). This compares with 2017 where there were £436,000 worth of fines. However, Senior Managers should take note that there seems to be a steady increase in fines against individual defendants as opposed to firms, in line with the theme of individual accountability. What is the largest SMCR penalty issued by the FCA? The largest financial penalty that the FCA has applied to an individual so far in 2018 has been £321,000 imposed against the CEO of Barclays (the PRA fined Mr Staley the same amount). He was found to have not acted on disseminated information, giving a false and misleading impression of the firm’s financial position. As the Financial Controller, he was fined for breaches on the grounds of the Financial Services and Markets Act 2000 and FIT related to market abuse, and a lack of fitness/propriety and client money/assets in the trading firm sector. What were the reasons for the fines given? The main themes emerging through the recent fines include market abuse, financial crime and anti-money-laundering (AML), as well as skill, care, due-diligence and fitness and propriety, all of which relate to conduct failures of senior individuals in their management roles. Going forward, it is expected that the FCA’s enforcement success might be determined not by the size of their fines, but the extent to which they have managed to impose a genuine culture of individual responsibility for regulatory breaches. How worried should we be about penalties attached to the extended SMCR regime? It seems that if you are able to demonstrate convincingly to the FCA that you have taken your responsibilities seriously then there is no need to lose too much sleep. As Mark Steward; Director of Enforcement and Market Oversight at the FCA explained last year – “The regime embraces a very simple proposition – a senior manager ought to be responsible for what happens on his or her watch”. How can we avoid being issued SMCR penalties by the FCA? Mitigating risk as a senior manager is likely to mean more than delegating spreadsheet tick boxes or system workarounds to your Head of Compliance or HR. Actus Comply provides you with a ready-made process and tools to embed accountability in your firm along with the evidence that you have taken your SMCR responsibilities seriously. For more information, contact us below.